September 21, 2005  Turin Brakes is a modern folk-pop duo out of Britain whose influences include Sebadoh, Prince, and the Black Crowes. 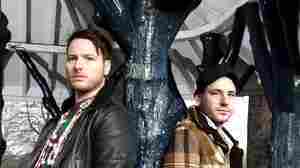 They've recently released their third album, Jackinabox, on Astralwerks records. September 30, 2010  In "Sea Change," the London folk-pop duo Turin Brakes makes the most of its impeccable vocal phrasing. Opening with a picked guitar line that wouldn't sound out of place if played on a banjo in a bluegrass band, the song moves with a bright and bouncy pastoral swing that's packaged alongside dark sentiments such as, "Six billion backs against the wall / Now, do we walk or run?"